This week challenge for the Late Night Stamper’s group is a Father’s Day card. I actually didn’t design this card but it is one of my favorites!! This card was designed by my downline and friend Michele LaCerda. Michele is in my downline but is actually the person that taught me to stamp!! She took me to my first SU party and then I just had sign up!! I wanted everything and my husband said that I had to find a way to pay for my addiction! LOL Then after I joined SU, she decided to signup. This July is actually her 10th anniversary as a demo!! Anyway – here is the card… The card base is going gray with the watch image from the Dapper Dad set stamped to create the background effect. I love the way she used the bottle cap for the face of the watch. The face of the watch is stamped in black and mounted onto the bottle cap. Crystal effects is applied over the stamped image to give it the look of glass. 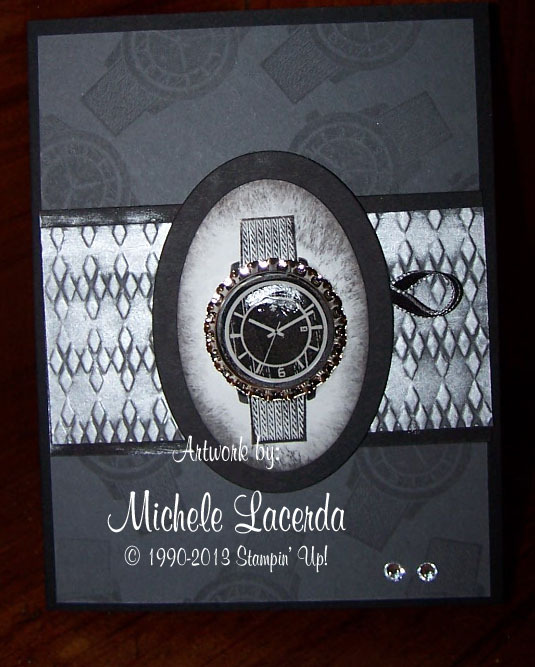 A piece of metallic silver cards tock is embossed for the background. This is my favorite card for Father’s Day that I have seen so far. Great job Michele! I will have to toot her horn since she doesn’t have a blog! Enjoy! handmade cards, Stamp with Marilyn, Stampin' Up!. Bookmark. Marilyn this is a perfect guy card! Great way to use the bottle caps also. So glad you played with us this week at LNS. What a wonderful masculine card! Thanks for playing along with us this week at LNS!